The College of Education is housed in the George I. Sánchez Building (SZB) located at the intersection of Martin Luther King Blvd. and Speedway in Austin, Texas. 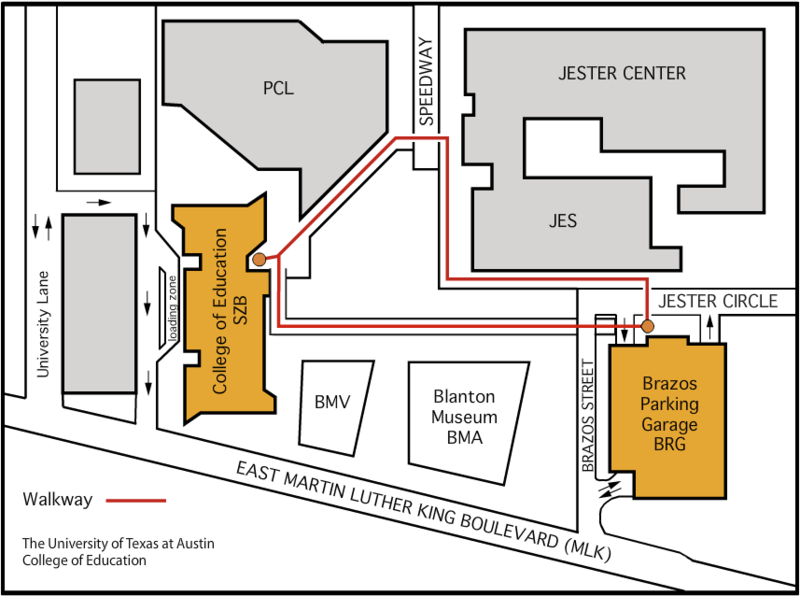 SZB is located across from Beauford H. Jester Center (JES) and in back of the Perry-Castañeda Library (PCL). The Department of Kinesiology and Health Education has its main offices in L. Theo Bellmont Hall which is located in front of the Texas Memorial Stadium (STD) on San Jacinto facing 21st St.
Additional offices are located in Gregory Gym and Anna Hiss Gym. Gregory Gymnasium is located on the corner of 21st St. and Speedway. Anna Hiss Gymnasium is located off Dean Keeton St.
Head West on MLK through three stoplights, turn right (North) on Brazos. 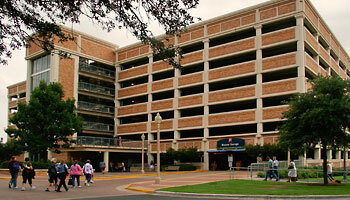 Park in the Brazos Parking Garage. The Sánchez Building (SZB) is just north of the corner of Speedway and Jester Circle. The airport is located about 13 miles Southeast of UT Austin. NOTE: There is a 30-minute loading zone area behind our building. Click on the thumbnails below to see the full sized map.